The season continues with episode 28. 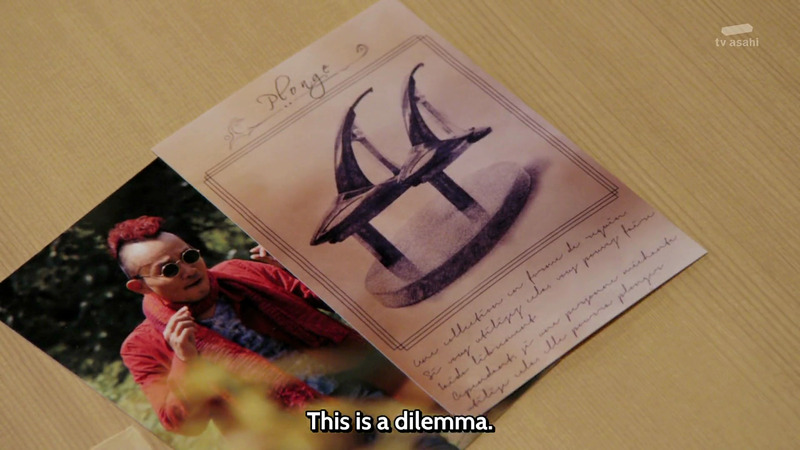 Last episode was a trip and this one seems to have a concept that could also lead to some bizarre or awkward moments. The preview showed us that Umika's Dad is coming to visit and Kairi has to pretend to be her boyfriend for some reason. What will happen? Click "read more" and find out. This episode begins right away with Umika's father arriving at the Lupinranger's Bistro for a surprise visit. As he walks in, he catches Kairi messing with Umika and his father fuse is lit, meaning he is not happy. Every had that female friend who had a Dad that hated all boys her age? 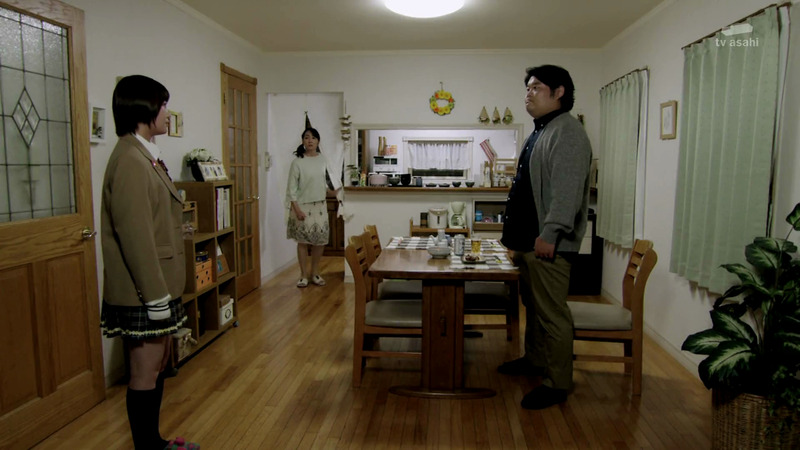 Umika's father accuses Kairi of trying to seduce Umika and ends up chasing Kairi down the street as Kogure comes into the Bistro for unrelated matters. Cut to intro! I must say, this episode has got my attention. Where is Sakuya when you need him? One theme song later, Kairi and Umika's dad still aren't back from the chase which is troublesome since Kogure has their next target. However, Kairi runs into this new Ganglar while feeling Umika's father and sees his power first hand. Coincidence much? Our new monster of the week has the ability to shoot smoke and turn people old. His name is Ryuugu Tamatebakko. Aren't humans fighting aging enough already? 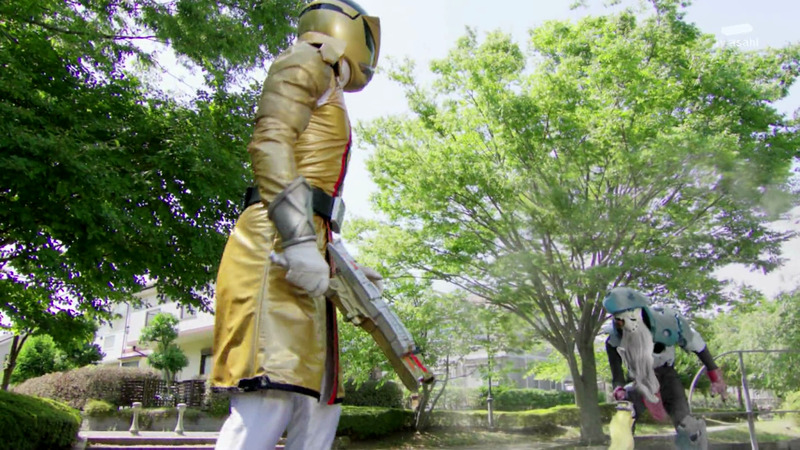 Umika's father catches up so Kairi is unable to henshin and instead the two flee with Kairi fighting off the Pordermen unmorphed. 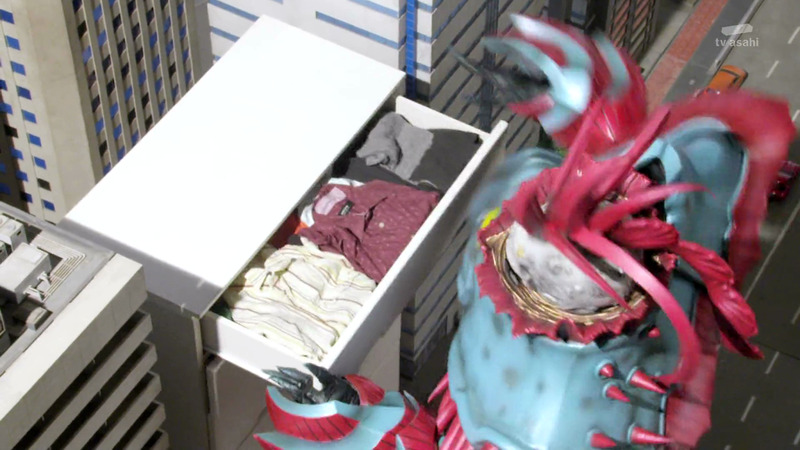 Unmorphed fights are rare these days, but he beat the Pordermen with a waste basket. Some of them fell back after having garbage thrown at them. Luckily, the Patrangers show up around this time and engage the Ganglar. This image was too funny not to show. Patran X dodges the Ganglars aging gas and it hits a Porderman. 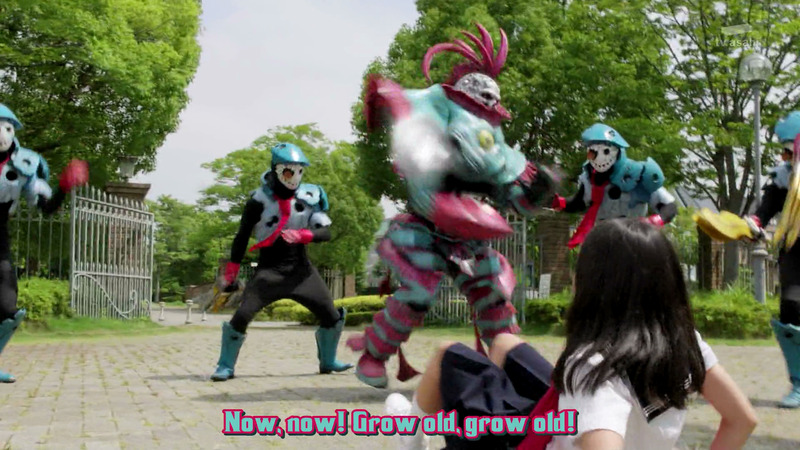 Who would have thought foot soldiers age. The fight is pretty traditional for Super Sentai standards; which is nice to see once in awhile for a season like this. 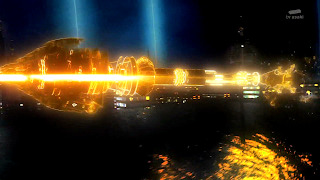 In the midsts of the fight, the Ganglars collection power is revealed to be a diving power that lets him dive into the ground like it is water. Just a reminder, there is the collection pieces power and the Ganglars individual power, two unique powers per monster. Yes, it gets confusing. 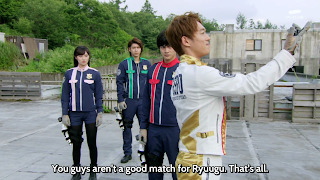 Ryuugu the Ganglar gets away and Umika's Dad thanks the Patrangers for their heroic deed to the annoyance of Kairi. A few scenes later, Tooma and Umika are investigating Ryuugu's hideout while Kairi keeps an eye on Umika's father. A job much for fitting for Umika. During this time, some back story is given on Umika. Turns out, when Umika decided to quit school and become a live-in employee, her father was dead against it but her mom said okay which caused Umika to only ever call her mother but not father. Despite having such a strain in their relationship, Umika's Dad (who still doesn't have a name) had to come see her on her 19th birthday. In both Power Rangers and Super Sentai the parents of rangers are rarely shown despite most of them being young. It is nice to see the human side of these heroes. Elsewhere, Umika is telling the same story to Tooma who surprisingly gets deep about the topic. Tooma says that Aya's father (his fiance's father) yelled at him the same way Umika's dad yelled at Kairi, blaming Tooma for Aya being lost. Umika is just shocked that Tooma would open up like that. Some pretty heavy stuff in this episode. Eventually, Kogure comes to take Kairi's place allowing him to leave. Meanwhile, Tooma and Umika have cornered the Ganglar at his hideout, henshin up, and begin attacking. 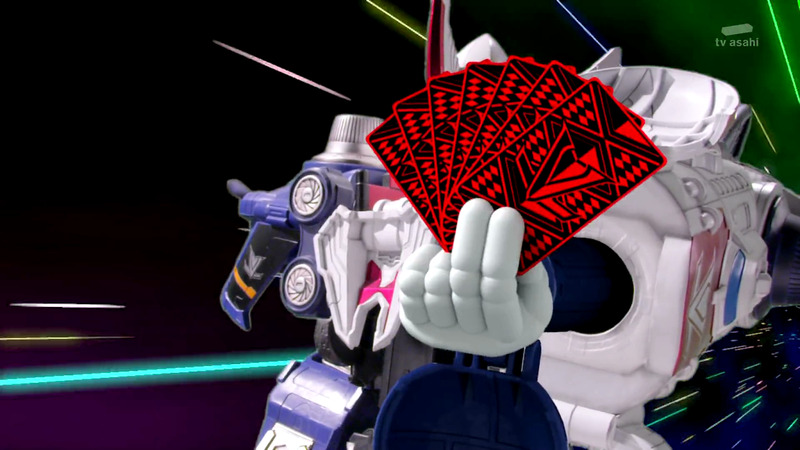 The Rangers are able to nullify Ryuugu's diving power by throwing cards on the ground; they knew this thanks to some info that Kairi sent them. (It was implied that Noël Takao gave that tip to Kairi after stealing it from the Patrangers research.) 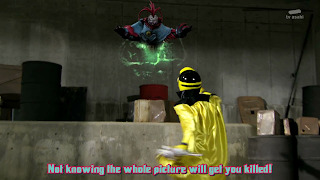 However, Ryuugu reveals that his diving power also works on walls which throws the Lupinrangers off guard. Really? Even I would have thought that could happen. Kairi and Noël Takao arrive just in time to save the others from defeat and the fight turns into a game of hide and seek with the Rangers shooting at the walls and always missing Ryuugu. But, things take a turn when Kairi uses the VS vehicle that Noël Takao gave him. 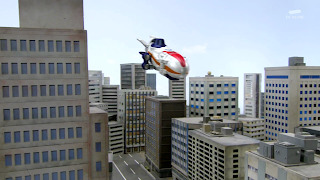 As a reminder, this VS vehicle was aquired by Noël Takao when he was first introduced. He got it from Kogure. 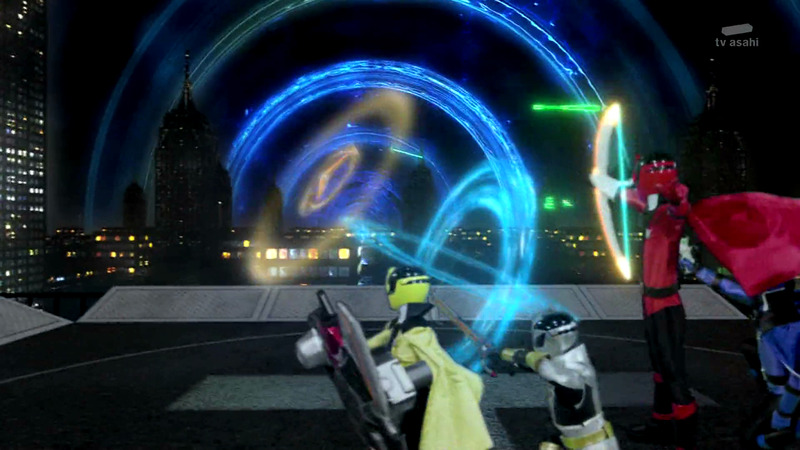 A magic bow & arrow strong enough to blast clean through the walls which enables Kairi to overpower Ryuugu and the fight ends with a combination of finishing moves that all have pretty CG backgrounds and effects. Monster goes boom, Goche makes it grow, the typical routine. Goodstriker appears and LupinKaiser is chosen. 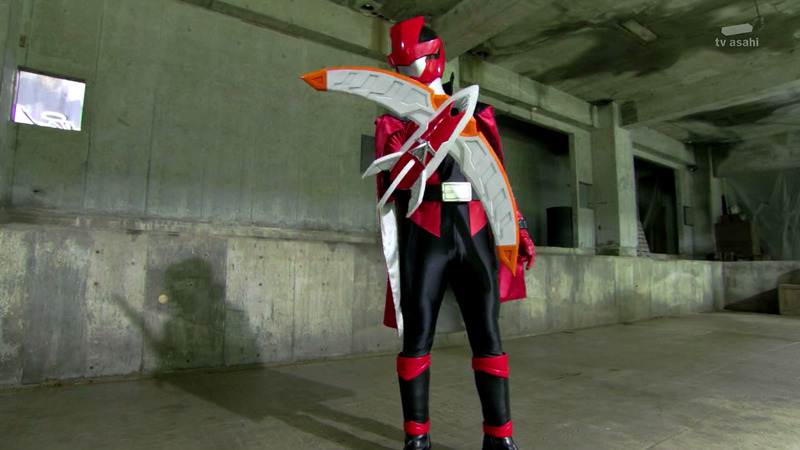 The Patrangers also appear and are again annoyed at Noël Takao for is behavior with the phantom thieves and for not contacting them about the Ganglar. It is moments like this that is making me team Global Police. The giant battle begins and wastes no time showing off the new VS vehicle and combination form. 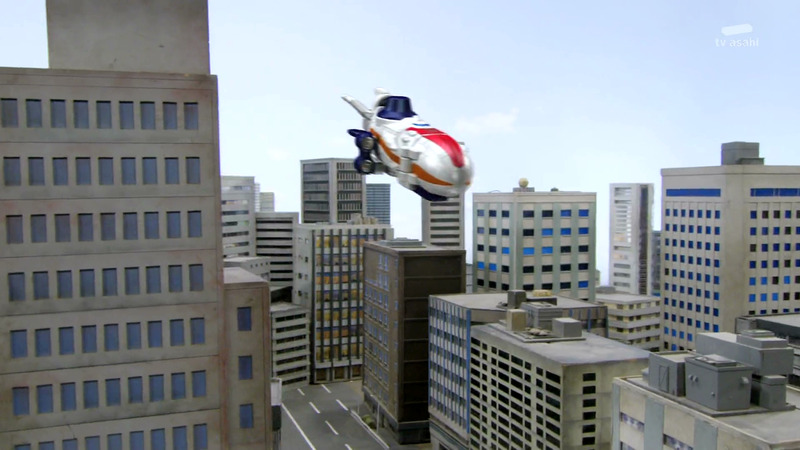 A Blimp called magic makes a bow & arrow for a ranger or a magician Megazord. Please happen in Power Rangers. LupinKaiser Magic uses a card trick that turns a building into a dresser than tells Ryuugu that their is a hidden treasure inside of it. Seriously? Why is the Ganglar going along with that? The treasure is just Magic in disguise that punches the Ganglar in the face. Hilarious...not. 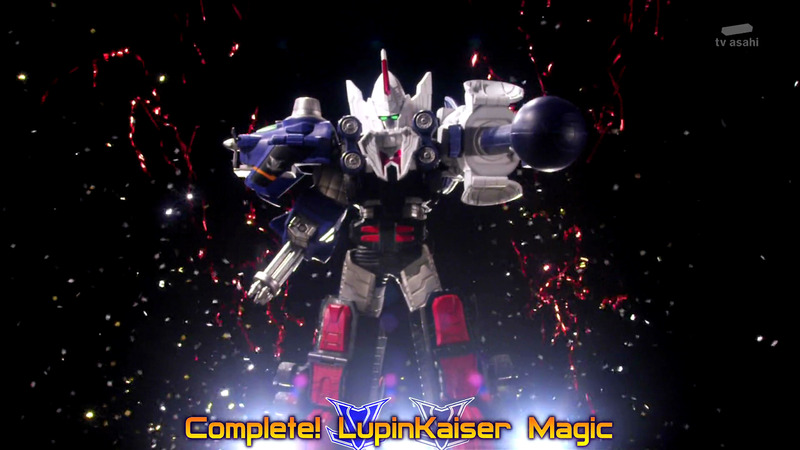 The Lupinrangers win by summoning an underwater castle in a bubble that blows up in the Ganglars face and they bid him an Eternal Adieu. This magic power feels so cheap. 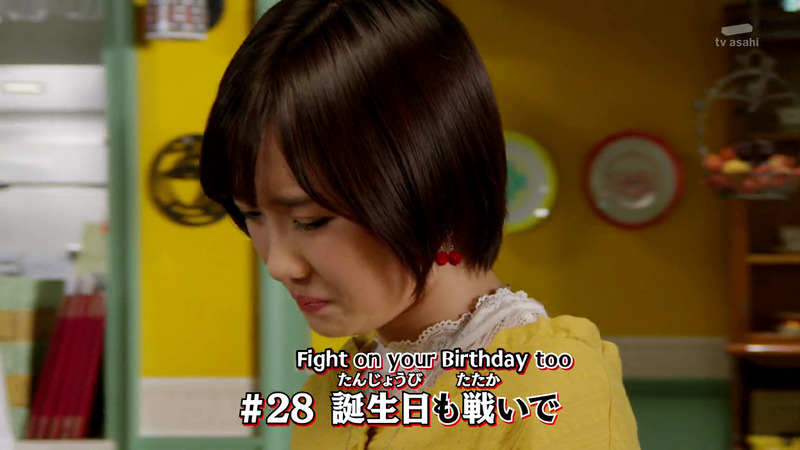 The episode ends back at the Bistro where Umika's father had already left but left her a birthday present. Anyone remember that plot line? After that, with a push from Tooma and Kairi, Umika catches up with her Dad and decides to spend one night with her family. Aww, touching ending.